The International System of Units (SI), commonly known as the metric system, is the international standard for measurement. The International Treaty of the Meter was signed in Paris on May 20, 1875 by seventeen countries, including the United States and is now celebrated around the globe as World Metrology Day. NIST provides official U.S. representation in the various international bodies established by the Meter Convention: CGPM - General Conference on Weights and Measures; CIPM - International Committee for Weights and Measures; and BIPM - The International Bureau of Weights and Measures. The SI is made up of 7 base units that define the 22 derived units with special names and symbols. The international prototype of the kilogram is the only remaining artifact used to define a base unit of the SI (rather than definition by a fundamental constant). The kilogram is the unit of mass; it is equal to the mass of the international prototype of the kilogram. The prototype kilogram is a cylinder with a height and diameter of about 39 mm and is made of an alloy of platinum and iridium. The SI plays an essential role in international commerce and is the commonly used in scientific and technological research and development. Learn more about the SI in NIST SP 330 and SP 811. 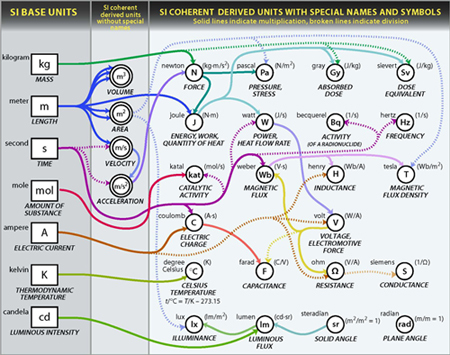 In November 2018, the world’s measurement experts voted and unanimously approved a revision of the SI that establishes a measurement system entirely based on physical constants of nature. The changes will take effect on World Metrology Day, May 20, 2019. In the revised SI, definitions of all seven (7) SI base units will be expressed using an explicit-constant formulation and experimentally realized using specific mises en pratiques (practical techniques). The set of seven (7) defining constants of the SI will be: the caesium hyperfine splitting frequency, the speed of light in vacuum, the Planck constant, the elementary charge (i.e. the charge on a proton), the Boltzmann constant, the Avogadro constant, and the luminous efficacy of a specified monochromatic source. Four (4) SI base units redefinitions have been recommended: the kilogram, the ampere, the kelvin, and the mole. Three (3) SI base units are already defined in terms of physical constants will be unchanged: the meter, the second, and the candela. Learn more about the Road to the Revised SI. Learn more about the SI Redefinition. How much do you know about the metric system (SI)? Try the NIST Metric Trivia Quiz online or use the Alexa skill to test your knowledge and be on your way to thinking metric!